The third annual Let's Celebrate Day will be held July 24 beginning at 11:00 AM at Cheshire Grange Hall, 44 Wallingford Rd. (one block east of the Town Hall), Cheshire. The event will include contest displays including, needlework, baking and crafts, photo and publicity, in both the adult and junior categories. The day will also include entertainment by "The Silk City Four, a Barbershop Quartet from Manchester. Their performance will begin promptly at 2:00 PM. The event will officially celebrate New Orleans and Mardi Gras as it's theme. Contest entries will be received on Friday, July 23, 2010 at Cheshire Grange Hall, between 9-11 AM and judging will begin at 1:00 PM. The Junior Department will be serving a meatloaf dinner from 12:00 noon until 1:30 PM. Cost of the dinner will be only $8.00 per person. 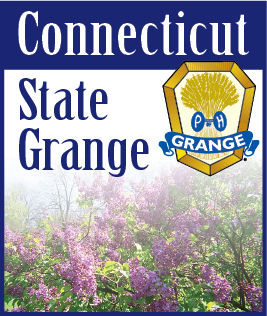 Many committees of the Connecticut State Grange are working together to ensure this event is a success.